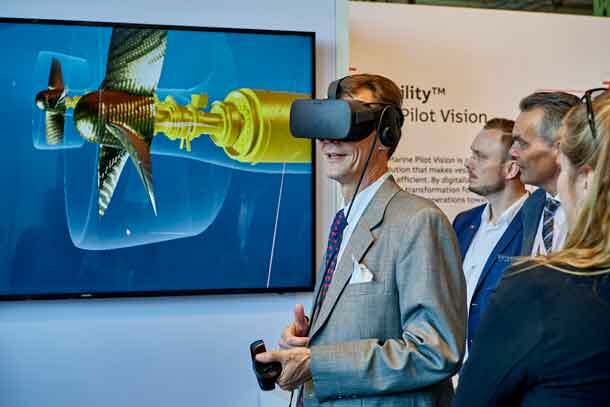 His Royal Highness Prince Joachim visited the Danish Maritime Fair on Wednesday, where he did the opening speech at the Danish Maritime Technology Conference. After his speech at the conference Prince Joachim went to visit a number of exhibitors in the fair hall, where the prince showed curiosity as always. In his opening speech at the Danish Maritime Technology Conference, Prince Joachim emphasised the importance of subjects such as digitalization and automation, subjects that will be discussed at the conference. He pointed out that we all depend on the maritime industry on a daily basis, when we purchase products deriving from foreign countries. This leads to good business opportunities, the Prince said. The majority of the large vessels are also equipped with Danish technology and products. "We are pleased that stands Prince Joachim for the third time. There has been a lot of interest in his opening speech the previous times. It is evident that the prince's commitment means a lot to the Danish maritime companies, for reasons such as they can show to customers and business partners that it is an important industry in Denmark with great national awareness, "says Jenny N. Braat, CEO of Danish Maritime. After the speech, Prince Joachim visited a number of maritime companies at the fair. Among these were Fayard where the shipyard’s owner Thomas Andersen stood ready to answer any questions the Prince had. Later at the fair, Prince Joachim was given the chance to try new technologies such as 3D glasses.